After Thanksgiving dinner was over and the turkey was picked almost clean, there's not much else to do except make stock. 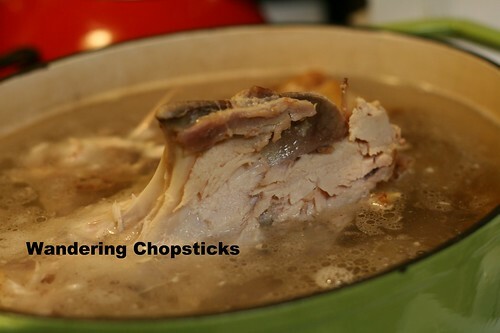 I'm not of the mindset that you need to doctor much to make a basic turkey stock. Onions, carrots, and celery are nice additions, but if I'm going to add them to soup, then I just turn the whole pot into Turkey Vegetable Soup. 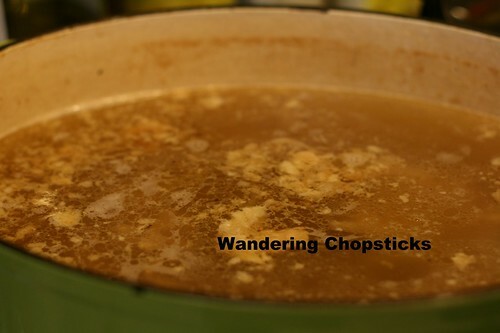 I just add water and simmer the bones for an hour or two to make a basic stock. I don't add salt until the broth has been simmering for a while because the turkey is already seasoned, so additional salt may be unnecessary. The only two things to keep in mind are to keep the heat on low to medium-low if you'd like a clear broth to make soups such as Bun Mang Ga Tay (Vietnamese Rice Vermicelli Noodle Soup with Bamboo Shoots and Turkey) and Mi Ga Tay Tiem (Vietnamese Egg Noodle Soup with Chinese 5-Spice Turkey), or at medium-high to high heat if you want a milky broth to make Shichimenchou (Japanese Turkey Bone) Ramen. That's it. 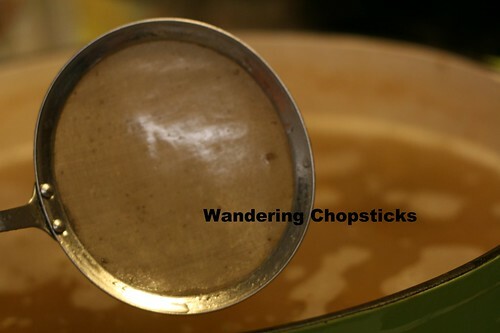 Of course, you can also add lemongrass or spices or any other seasonings you wish, but the key to a good broth is more about heat level for whichever type of broth you want and let it simmer for a while, and skim to remove scum and other impurities. Optional: Add an onion, carrots, and celery to sweeten the broth if you wish. 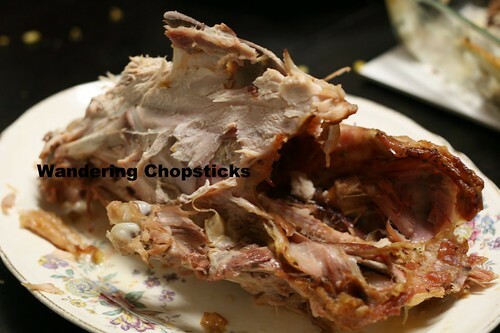 Once the turkey is all eaten and the meat all sliced off, break down the carcass to fit into a stock pot. Add enough water to cover the bones. If the carcass doesn't all fit, don't worry. Once the bones start simmering, they'll soften and you can immerse the bones in a bit. I like to use my enameled cast iron pot because it retains heat better, thereby extracting more flavor from the bones. 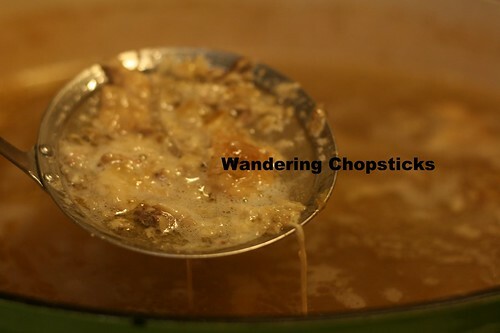 Lightly cover the pot and let simmer for at least an hour or more. I left this broth on low for about four hours. Gross fat and scum have risen to the top. I use my Japanese skimmer spoon to scoop all the scum and impurities out. See the fine mesh? It also scoops up fat. 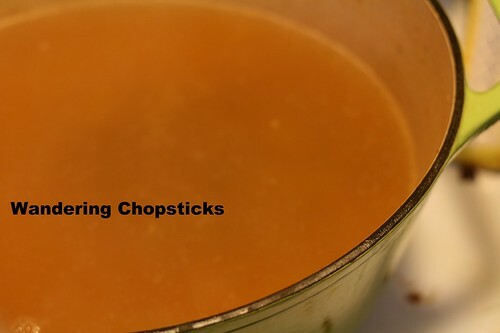 If you don't have one, let the broth cool down and refrigerate overnight. The impurities and fat will solidify on top and it'll be easier to remove. 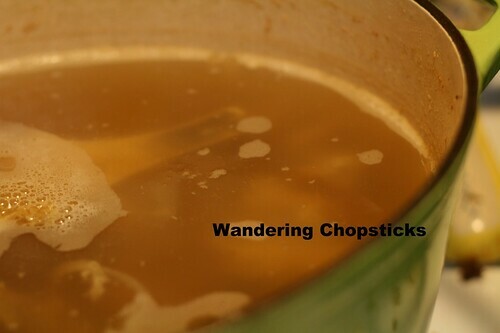 Otherwise, with the skimmer spoon, the broth is relatively clear on top now. Taste the broth and add seasonings if necessary. 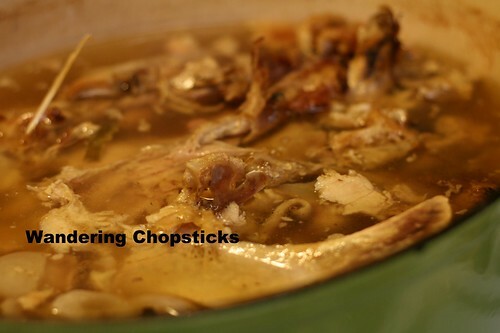 Once the broth is flavored to your liking, remove the bones and you'll have a clear broth. Now, the broth can be made into all sorts of soups. 1 year ago today, Soda Sua Hot Ga (Vietnamese Condensed Milk Egg Soda). 2 years ago today, Thanksgiving leftovers afternoon tea. 3 years ago today, Japanese fusion imagawa-yaki at Fulfilled - (Beverly Hills) (Closed). 4 years ago today, tagged!